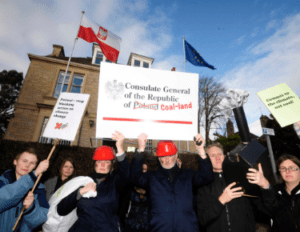 Campaigners gathered today outside the Polish Consulate in Edinburgh, to highlight concern about the Polish Government’s commitment to coal at the expense of the climate. The event took place as UN delegates meet in Warsaw for the global climate negotiations. It also coincides with an international coal conference, hosted by the Polish Government, which campaigners see as an inappropriate clash. Poland is a significant blocker of increased action on climate change at an EU level. It is almost completely reliant on highly-polluting coal for its energy needs. “The Polish Government is increasingly isolated in its position on climate change. Countries across the world, including Scotland, are recognising the need to reduce greenhouse gas emissions urgently and are taking action to do so. “The current UN talks in Warsaw are an important step to agreeing a new global agreement on climate change to replace the Kyoto Protocol. 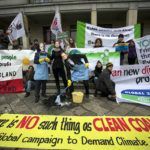 We call on the Polish Government to ditch its commitment to coal and play its fair part in avoiding climate catastrophe. “As a Pole living in Scotland, I am proud to live in a country which takes climate change seriously. Scotland was one of the first countries to commit to stretching climate change laws.